Bat Killer Identified. | evolveit! (Left) Healthy little brown bat, Myotis lucifugus (Right) Little brown bat infected with white-nose syndrome. Since its first appearance in a New York cave in 2006, white-nose syndrome (WNS) has been associated with massive population declines in North America bat species. The syndrome is characterized by the appearance of a white fungus on skin, and notably on the nose, of hibernating bats. Unfortunately, these fungal growths are also associated with frequent disturbances during hibernations, a lack of important fat reserves and death. In caves hit by the disease, colonies are reduced in size anywhere from 30 – 99% and the floor of the cave become littered with the bodies of dead bats . Since its emergence, scientists have been working rapidly to determine the cause of this disease and suggest potential strategies to reduce its spread and help recover infected populations. A new fungus species, named Geomyces destructans was quickly identified as the culprit that causes the white fungal growths . However, it was unclear whether the presence of this fungus is the primary cause of the disease or just a opportunistic infection occurring on bats sick with a yet unidentified culprit, which would be consistent with the majority of fungal diseases that attack animals. This second possibility was also supported by the discovery that G. destructans is found on the skin of bat species in Europe without any significant associated mortality . A study, published this December in Nature, provides the most conclusive answer to date as to what actually causes this devastating syndrome . Lorch, et al. (2011) asked three important questions: (1) Does exposure to the fungus G. destructans alone cause the symptoms associated with WNS? (2) Is WNS transmissible between individuals? and (3) If transmissible, can WNS spread through the air, or is closer contact required? 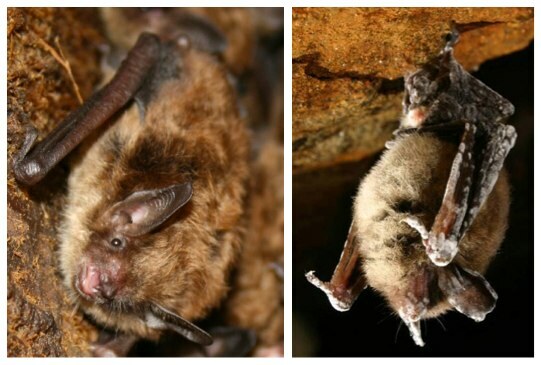 To determine whether exposure to G. destructans is sufficient to causes WNS in healthy individuals, the researchers collected healthy little brown bats (Myotis lucifugus) from a population outside of the current range of WNS and exposed them to G. destructans fungal spores. By the end of the experiment, all 29 bats exposed to G. destructans spores had developed WNS. None of the 34 control bats, which were not exposed to the spores, showed any symptoms of the syndrome, indicating that exposure to G. destructans alone is sufficient to cause WNS. Secondly, to determine whether individuals infected with WNS can transmit the disease to healthy individuals, the researchers housed 25 naturally infected bats with 18 healthy individuals. Eighty-nine per cent of the healthy individuals showed symptoms of WNS by the end of the trial. However, when the researchers housed infected and healthy individuals separately, but in close proximity, none of the healthy individuals contracted WNS. Together these results indicated that WNS can be transmitted through contact with fungal spores from infected individuals, but that these spores are likely not capable of airborne transmission. Lorch et al. (2011) argues that this study shows that G. destructans alone is the primary cause of WNS and the massive number of bat deaths in the Eastern United States and suggests that G. destructans is likely native to Europe, where bats appear to be immune to its destructive effects. Interestingly, the high degree of mortality associated with WNS in wild populations was not observed in any of the experiments included in this study. The researchers attribute this to the fact that the bats included in the study had a much shorter period of exposure to the disease than would likely occur in wild populations. However, this still leaves open the possibility that the destructive effects of WNS on North American bats are not due to G. destructans alone. Photo Credits – Little Brown Bats: Left, Right.